Promotional stunts can be an interesting way to spend an afternoon. Especially when they involve fire. And food. Tomorrow, in Los Angeles, El Pollo Loco will combine the two in a big way. Like Guinness World Record big. Well, at least the fire part. Read on for the press release, and yes, I posted this solely because of the promotional graphic above. 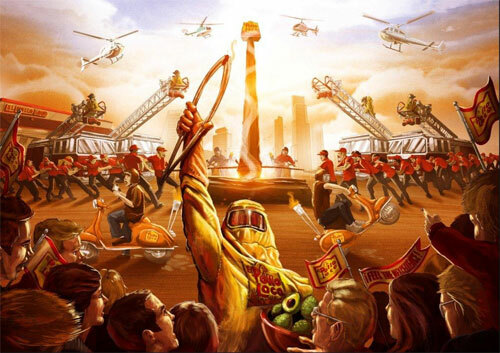 WHAT: As part of the launch of its “El Pollo Loco ¡Feel the Mexcellence!SM“ campaign, the flame-grilled chicken leader will erect a 25-foot bow drill, a fire-making tool, in an attempt to break the existing Guinness World Record® for the largest one out there, which boasts a height of 16.4 feet. The California-based restaurant chain will gather more than 50 El Pollo Loco crewmembers to vigorously pull the ropes of the massive bow drill and try to generate enough friction to create fire. If all goes according to plan, the flame will be placed on El Pollo Loco-wrapped Vespas to signify the spreading of flame to El Pollo Loco restaurants north, east, south and west so all restaurants are symbolically united by the same flame — hand made by its employees. The event can be viewed by the public. WHY: El Pollo Loco prides itself on serving food largely made by hand. Fresh chicken is cooked to perfection over flames by experienced Grill Masters. Fresh serrano peppers are sautéed for pinto beans. Chicken tortilla soup is prepared fresh daily. Salsas are hand-made every day from fresh tomatoes, onions, cilantro, and serrano peppers. Taquitos are hand-rolled. About the only thing not made by hand is its fire, and El Pollo Loco believes it’s time to change that! The flame-grilled chicken leader’s new campaign focuses on everything El Pollo Loco does to deliver guests an exceptional experience. Kicking off the campaign, 50 top crew members were selected to participate in a Hand-Made Fire event that builds love for the brand and symbolically unites restaurants through a single flame. The event will be filmed and featured in new television commercials by El Pollo Loco’s advertising agency, Hollywood-based goodness Mfg. The spots are scheduled to air next month in select west coast markets.